I have a lot of unfinished projects in my house. 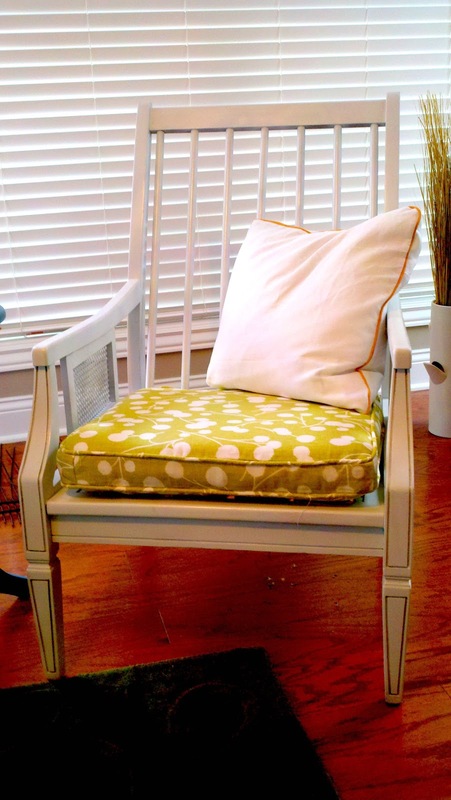 This is the story of one thrift store chair. It was at least 9 months ago that I discovered a hidden gem of a thrift store here in Bloomington. 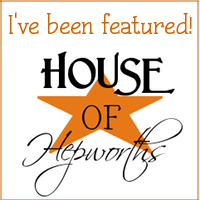 For you townies, my secret place is called "Thrift Store" (creative, right?) on Walnut Street near Bloomington HS South. 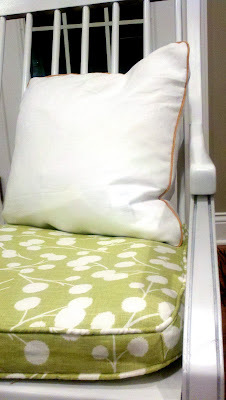 On my first ever trip there, I was still on a cane chair kick after cruising Pinterest. As fate would have it, guess what was sitting there front and center? After a couple of not-so-intelligent Goodwill purchases, I promised myself that I'd take a photo and sit/sleep on it whenever I found a piece of furniture at the thrift store. This is the cell phone pic the followed. 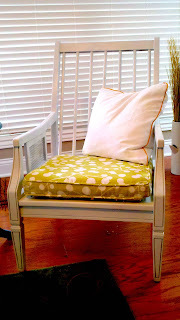 Fast-forward a few days and I got this chair and its identical twin home for $25 each!! They still didn't look - or SMELL - much better once I got 'em in the house. Being a safety person in "real" life, you won't have trouble freaking me out about mold and spores, so the "fragrance" emanating from the stained and torn cushions were convincing enough to banish them to the outdoors. (Likely? no. Odorrific? yes.) Here's a photo shoot of some of the details before I started thinking about black mold. This moldy stained cushion is SO photogenic. Oh yeah -- and here was the icing on the cake. This photo really doesn't come close to showing you what this stuff was really like! 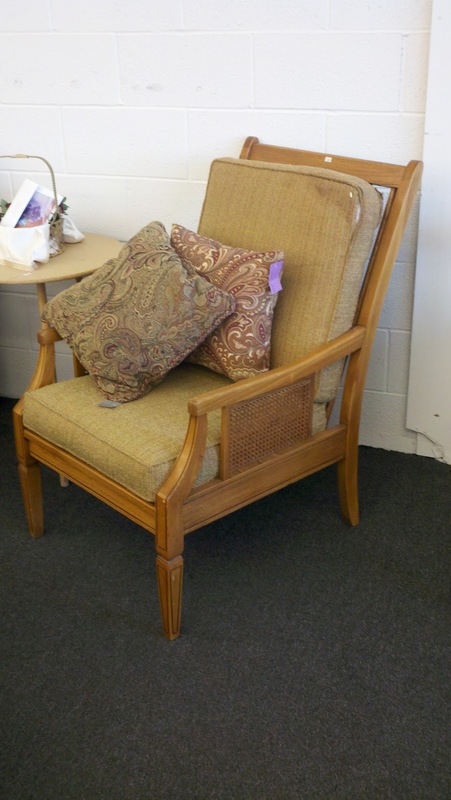 Maybe a 500-pound person sat in this chair daily for years... this pre-makeover chair was a seating hazard! These chairs sat around in the house f.o.r.e.v.e.r. while I gathered up the things and the time to work on them. The cushions, needless to say, were completely gone and I threw them away. I spent the next few weeks with a hammer, flat head screwdriver, and needle-nosed pliers pulling out the tacks and staples that held the seat on. It was so old and crumbly, it did not come off without a fight. Hundreds of those tiny little staples! Besides the seat, the frames of both chairs were sturdy and in great shape. 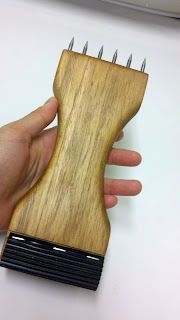 My first step was sanding -- sanding and sanding and sanding. 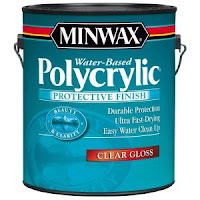 I used a 80 and then 100 grit sandpaper, which seemed to work ok. Don't use anything smaller than that if you do this yourself... I found that the 60 grit left pretty deep "scratches" that took a while to smooth out with a finer grit. 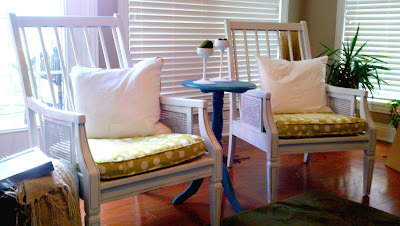 I spray painted both chairs with Rustoleum Semi-Gloss White, which took 2 cans per chair. I used a really fine grit (180) sandpaper to smooth out the bumps once it all dried. 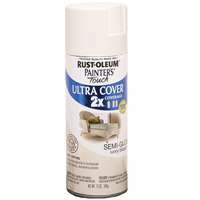 (Nope, I didn't get endorsed for this, but I do like the sprayer head on the Rustoleum spray paint cans because they're not as messy as others I've used.) 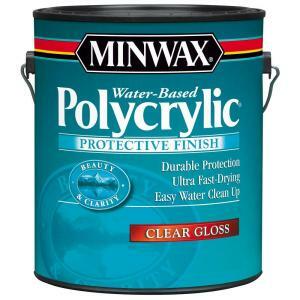 The top coat is brush-on MinWax poly in Clear Gloss, to help protect it and give it a little shine. A little of this stuff goes a long way. The frames sat around with empty seats for another really long time. 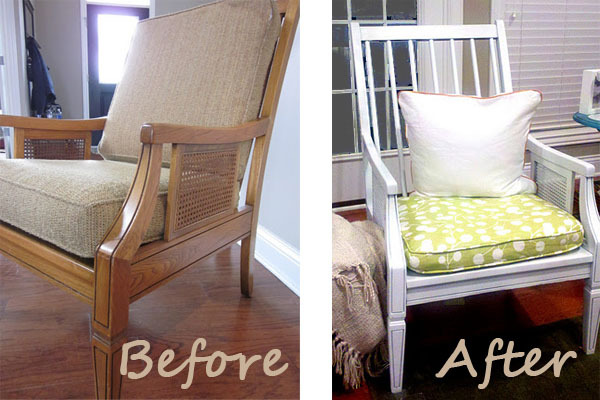 All it took was some jute strapping and a chair torture tool called a stretcher (both which you can purchase at Jo-Ann's) . Sorry I don't have any in-progress photos of this, but what you do is staple or tack one of end of the strapping to the frame, then put the pointy ends of the stretcher through the jute, rest it against the frame, and pull down so you're pulling the strapping extremely taut. Staple the other end. I would've needed three hands to take photos of this! The idea is to criss-cross them to make the seat. ...Except I didn't discover these tutorials until AFTER I'd done all of this engineering (that degree had to be good for something, right?). Ok, so moving on. I sewed a bunch. I ordered the fabric, by Thom Felicia, from Calico Corners. The randomness of the pattern seems to offset the rigid structure of the back rails. Time for some sewing pics! 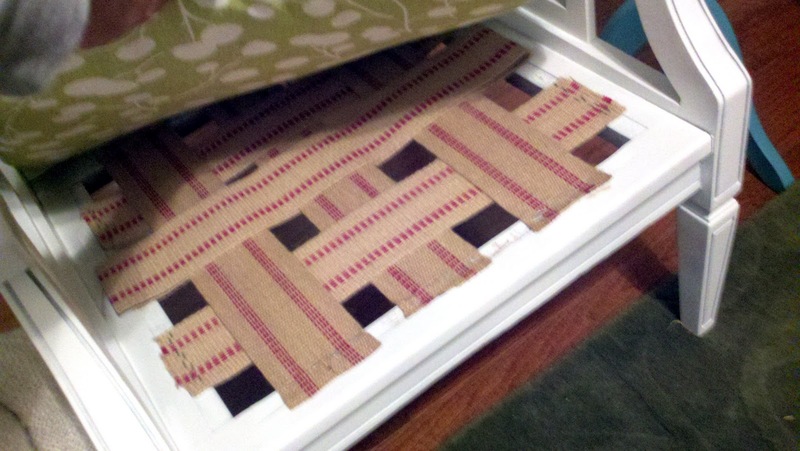 This is how you do corners.... and attach piping. Sewing projects take a lot of thinking! 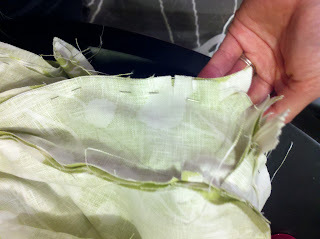 Here's a corner where the zipper joins, inside-out. 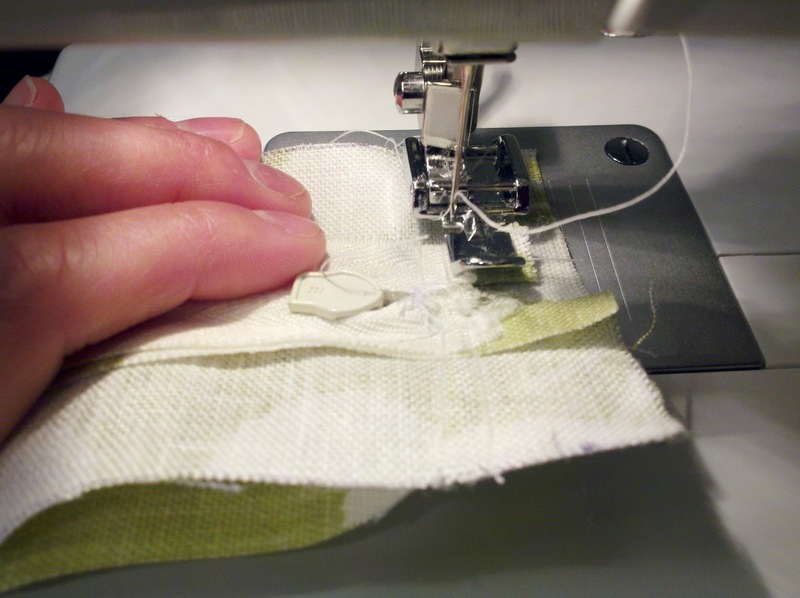 You NEED a zipper foot, not just to do the zipper, but for the piping. Did I tell you I'm proud of my sewing? Before this, all I knew how to do was hem my jeans and pants, so I'll tell anyone who's willing to listen. :) Moving on. 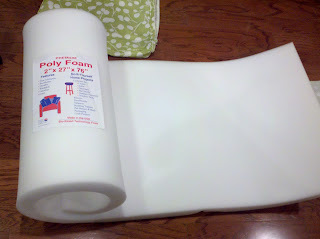 I bought some foam from Jo-Ann Fabrics, cut it to size, and wrapped it with soft but thick batting. If you do this, make sure you buy this stuff in stages over a few weeks - these supplies are not cheap... they cost more than the chairs themselves! 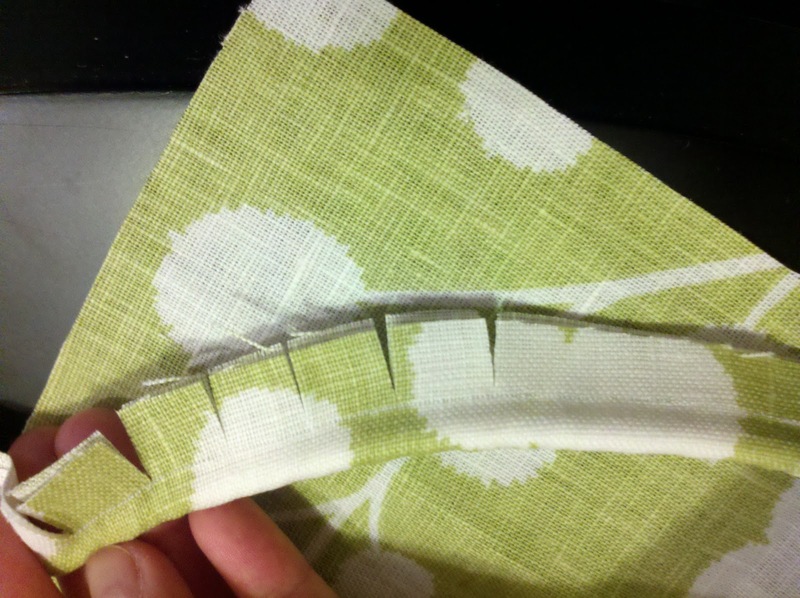 I cut them to size (minus an inch+ on each size to allow for batting) and carefully shoved them into the cushion. 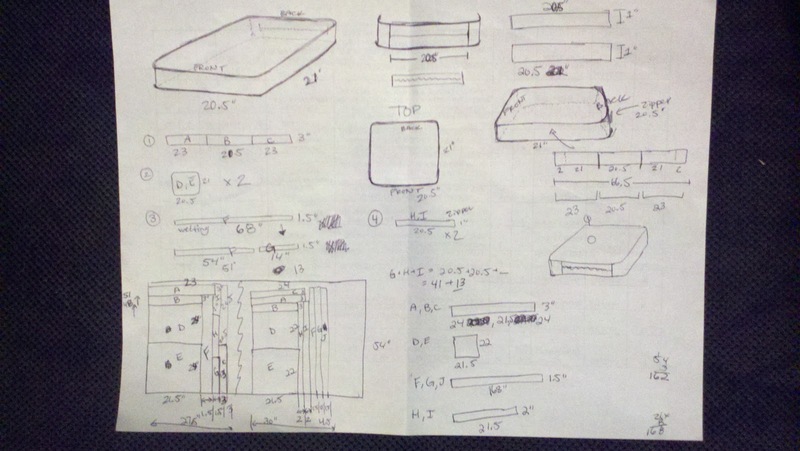 For the throw pillows, I just bought an insert from Ikea. The throw pillows are still missing something. I feel like the orange piping is good, but doesn't stand out enough. It just looks like a plain white pillow. Anyone have ideas? How about a little celebratory B&A? It feels good to actually finish a project. How about you? Are you sitting on any half-complete projects? Wow! They look fantastic. I am glad you went back for them.. you gave them the tlc they needed to really shine. I also like that you left the cushion off the back! What a transformation!! You did such an awesome job, the end result is well worth all the effort, well done!! I really think this style of chair requires two full-size cushions to look right. The "before" pics look more balanced and pleasing to the eye. The "after" pics look amateurish and incomplete. Would love to see these chairs finished with complete cushions!